When an enthusiastic young winemaker comes to a winemaker dinner that is well thought out, that’s the best! This was the case at a recent Six Peaks Grille winemaker dinner, part of an ongoing series hosted in this fine dining restaurant at The Resort at Squaw Creek. This winemaker was Michael Scorsone of Adobe Road Wines, a Sonoma winery that specializes in small lot, handcrafted wines. Michael Scorsone brings a culinary background to his winemaking, and that means very food-friendly wines. His family is a deeply rooted Sicilian “food and wine family”, he noted. He is also a graduate of one of America’s top culinary schools, The Culinary Institute of America in Hyde Park, New York. 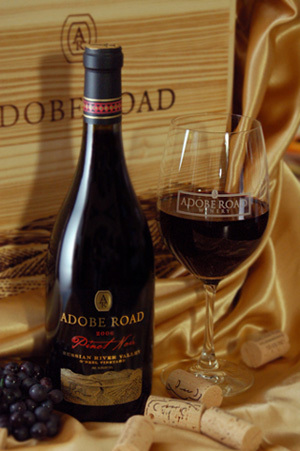 Adobe Road produces between 3000-4000 cases of wine yearly, depending on the harvest. Adobe Road’s 12 different wines are produced from local grapes, sourced through long-term leases with growers. The winemaking style is “very traditional”, according to Michael, “ and we like to show a lot of personality in the wine.” Winery owners Debra and Kevin Buckler apply the same attention to detail in their wines as was done in their other business, professional motorsports. We began the dinner with the 2009 Adobe Road Dry Creek Green Vineyard Sauvignon Blanc. “We pick our grapes riper than other Dry Creek wineries, in order to give us that unique texture, resulting in a food friendly wine. We also barrel age our Sauvignon Blanc, which is not often done in California,” Michael said. The result is a delicious wine that’s golden in color, and tastes reminiscent of a Gravenstein liquid apple pie. There’s caramel, vanilla, nectarine and peach tones, with a citrusy tint. Some spice and tropic fruit add to the flavor profile. 14.1 percent alcohol, $19 the bottle at retail, slightly more at Six Peaks’ tableside. Chef Chad Shrewsbury of Six Peaks Grille paired this wine with pan seared scallops with wild mushroom, cockle and carrot touches in this dish. For the main course of this dinner, filet mignon, the beef practically called out for a Pinot Noir, and the Adobe Road 2006 Russian River Pinot Noir was a great choice. The grapes are sourced from the O’Neel Vineyards in Russian River, and this area is a pinot noir growing region that is among the warmest in California. Only 250 cases of this wine were produced. The wine was full-bodied with enticing aromas of red cherries, cedar and spice. Sadly, this vintage is now sold out, but the 2007, also sourced from the O’Neel Vineyards, also is yummy with aroma of strawberry jam, raspberry and allspice. Fine tannins give a silky mouthfeel. 14.1 percent alcohol in the 2007, $48 the bottle at retail, slightly more at Six Peaks’ tableside. You might consider this for your holiday wine. The 2006 Adobe Road Knights Valley Bavarian Lion Vineyard Cabernet concluded the dinner, paired with a selection of California cheeses and seasonal fruits. This wine is made from grapes that are grown on the valley floor where the Bavarian Lion Vineyard is located, so the berries are small and the vines must struggle. The result is a concentrated flavor, and it is a rich and almost chewy Cabernet, very classic in style. Strawberry and chocolate flavors follow this wine from the front of the tongue to its long finish. Cedar, dark raspberries, a hint of anise, cloves and black olives make this a classic Cabernet. It was aged for 24 months in French and American Oak. 15.8 percent alcohol, $48 the bottle at retail, slightly more at Six Peaks’ tableside. Thus, I couldn’t miss the PlumpJack Café winemaker dinner this autumn that featured wines from Orin Swift Cellars. A few years ago, the great winemaking palate behind the Orin Swift brand, Dave Phinney, sold two brands to Huneeus Vintners. One of the brands was The Prisoner. Why does this matter? Because even though Phinney sold the brands and inventory, Phinney remained as winemaker; he retains ownership of Orin Swift Cellars and its other wines. So that great palate is still blending this delicious red wine for all of us who love it. Kevin Fox, who was presenting the wines at the PlumpJack , is the assistant winemaker. The 2009 Napa Valley red wine, “The Prisoner”, was paired by Plumpjack’s executive chef Ben “Wyatt” Dufresne with a Hawaiian Ahi served with bacon confit marble potatoes, truffle salt gel and a porcini-blueberry vinaigrette. The cherry, cassis and black fruit taste is dominant throughout from first sniff to first taste to finish, and the tannins are so well integrated in this wine that I experienced them as very soft. It’s a dark red wine. Add the velvet of American and French Oak, and you’ve got a great big lush wine with a massive entry. Plumpjack has a good program for these high alcohol wines (The Prisoner is 15+ percent alcohol ) by offering 3 ounce and 6 ounce glasses. The Prisoner is $7 for 3 ounces, $14 for 6 ounces. The 2008 Papillon Red Wine, Napa Valley, is a finely tuned Blend of Cabernet Sauvignon with just a touch of Petit Verdot, Merlot, and Cabernet Franc. The 2008 is their fourth vintage of Papillon, and features grapes sourced from Howell Mountain, Saint Helena, Rutherford, and Oakville. Chef Wyatt paired it with a Durham Ranch filet mignon, accompanied by Montgomery Cheddar Mac n’ cheese. The pairing was perfect, as this is a bit more of a serious wine with good cellaring potential too. Deep red in color, aroma is classic Napa Valley Cabernet Sauvignon: cedar, rose petal, hints of soft French oak. A nice ripe raspberry and boysenberry flavor to begin, and as it opens up, there is cherry, plum and cassis. 15.5 percent alcohol. $10.50 for 3 ounces, $21 for 6 ounces. To end on a sweet note, the cardamom opera cake with huckleberry sorbet was paired with the 2009 French wine from Orin Swift’s project there, the “D66” Grenache. The winery and vineyards in Maury, France are in the outer Roussillon very close to the Spanish border and nestled in the Pyrénées-Orientales. These vineyards were planted 60 years ago, and the blend of fruit (Grenache, Syrah, Carignan) results in a wine that is a dark opaque red color with aromas of toasted oak, ripe blueberry jam and dried rose petal. There’s a minerality and acidity that give this wine a nice long finish. 15.2 percent alcohol. $7 for 3 ounces, $14 for 6 ounces. 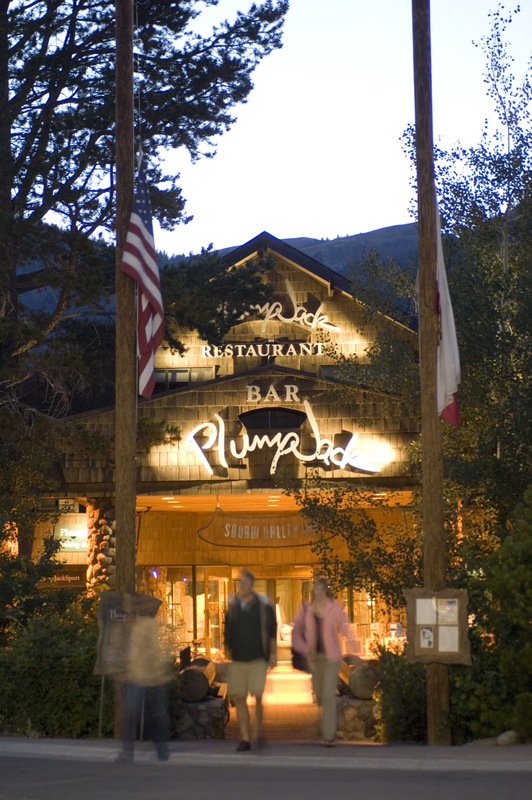 PlumpJack Café at the Squaw Valley Inn, 1920 Squaw Valley Road, Olympic Valley CA, holds an outstanding series of winemaker dinners, and its wine list and regular menu are spectacular too. Reservations: (530) 583-1576 More information at www.plumpjackcafe.com. Antonini Wines Featured at West Shore Cafe: Wine Educator George Foote Presents! There is absolutely no place on the West Shore of Lake Tahoe that is a beautiful and elegant as The West Shore Café in Homewood. Thus it’s appropriate that they launched their winemaker dinners with beautiful and elegant wines. The Antinori wines presented in the USA in partnership with Ste Michelle Wine Estates provided a wide range of tasting experience and the chance for West Shore’s Executive Chef William “Rusty” Johns to show off his art. George Foote, the Maryland-based and well-known National Wine Educator, was there courtesy of Ste Michelle to share stories of these Antinori wines. Marchese Piero Antinori, the 26th generation of his family to sell wine, took the reins of the company in 1966. Somewhat of a renegade, he challenged the Italian authorities on their categorization of wines, and forged ahead with production of highly consumable food-friendly wines at affordable price points. Wines from Tuscany boomed. 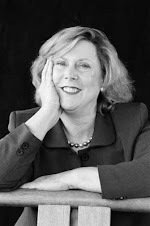 Now, in this generation, the three daughters of Piero Antinori are continuing the tradition of consistent excellence. This is one of the 10 oldest wine families in the world! The Sangiovese “Santa Cristina”, Antinori, Tuscany 2009 was originally introduced in 1946 as a Chianti Classico by Piero Antinori’s father. Technically, this wine is a Super Tuscan, although it is not marketed as such. Primarily Sangiovese, it is blended with 10 percent merlot, and new in the 2009 vintage, 5 percent Cabernet. It’s a modern style Tuscan red wine, ready to be consumed, and it is referred to as “italy’s Favorite Wine.” Ruby red in color, the aroma is intense with cherry and raspberry fruit, hints of violet and toast too. It’s a very smooth wine, with soft tannins that are controlled and delicious, and a nice finish. 13 percent alcohol. $12 the bottle. Local distributor Southern Wine & Spirits is a believer in this wine, so in addition to being available at West Shore Café, Dockside 700 in Tahoe City also sells it by-the-glass and bottle. Chef Rusty paired it with Cioppino. Perfect. The Tignanello, Tuscany, Antinori, IGT, Tuscany 2007 is a legendary Super Tuscan. The winery has focused on Sangiovese clones for years to improve this variety, and lets the fruit express itself through careful blending practices. This is the wine that singled-handedly altered the Italian wine laws, courtesy of the stubbornness and wisdom of Piero Antinori, allowing special wines from all regions throughout Italy to be produced in the new category IGT. The Tignanello is 80 percent Sangiovese and 15% Cabernet, with 5% Cabernet Franc added for balance. It is an intense ruby red, with aroma of ripe fruit and spice, vanilla and toast. Richly textured, the structure is complex and flavors are long and persistent with hints of chocolate, huckleberry and black plum on the finish. Tannins are managed well with this wine, and it is truly elegant. 14% alcohol. $100 the bottle. Paired delightfully with Chef Rusty’s T-bone steak prepared Italian style. The Marchese Antinori Vin Santo 2006, Tuscany, DOCG , comes only in 500 ml bottles. Made in Tuscany since the medieval times, it maybe have been used during Mass. Antinori Vin Santo uses Malvasia and Trebbiano grapes from the Antinori estates in the Chianti region. Air dried in a loft and then pressed after several months, a long slow fermentation takes place over three years. The result is a bright yellow amber-hued dessert wine, with hints of honey and dried fruit. 15-16 percent alcohol. $42 the 500 ml bottle. The dessert pairing was an apple/pear tart.